In two visits to the Oak Tree Arena in 2014, the Rye House Rocket amassed just 46-points, and in truth, on both those occasions, they were a shadow of the team, who traditionally have given the 'Cases' Somerset Rebels such a hard time over the years. However the Hoddesdon class of 2015 have already shown that they may have taken the first tentative steps back on the road that lead to their former glories. They had handed the Rebels a 17-point defeat at their Hertfordshire base, just 3 weeks ago, to add to some impressive results to start the season. So it was to this background that they arrived at the Oak Tree Arena of Friday evening. Without their regular number on, Edward Kennett, and two reserves, many may well have thought that they were easy meat, but in Kennett’s place they had drafted in former Rebel Claus Vissing, who knows the Highbridge circuit like the back of his hand, and at reserve, Daniel Greenwood, and Alex Edberg. Also their line up included the extremely impressive new boy, Nikolaj Busk Jakobsen, and another man with a liking for the Oak Tree track, Robin Aspegren. After the previous nights heavy defeat at Ipswich, Garry May was looking for his team to ensure that they not only won, but also restricted the Rockets to a score that saw them leave Highbridge, with nothing to show for their visit. May’s wishes looked to have been answered in Heat 1, as the Rebels sped to a maximum advantage at the first time of asking. The field broke level, with Robin Aspegren leading slightly before the turn, before Josh Grajczonek powered around this outside to hit the front as they entered the back straight. Meanwhile Leigh Lanham, who had found himself to the rear, shot through the inside off the final bend of the lap, after a mistake from the Swede gave him a clear view of the front. Once on Grajczonek’s back wheel he made no mistake, and easily held off the Rockets pairing, who seemed to get in each other’s way at times. If the opening heat had given the impression that the Rebels would once again be serving up a huge battering to the Rockets, nothing could be further from the truth, and over the next few heats, Len Silver’s men showed that they have a lot more about them than their recent predecessors. The next two heats were shared affairs, with Paul Starke leading virtually every inch of the way after getting the better of another level start in Heat 2. Benji Compton also made a good start, and was soon on Starke’s wheel, but his position was immediately under attack, and it wasn’t long before Daniel Greenwood and Alex Edberg had swept passed the Rebels reserve, relegating him to the rear as they hit the back straight. Starke was comfortable in the lead, and relatively untroubled, except for a brief challenge from Edberg on the third lap. At the rear Compton was struggling and the further they went the further he dropped back. Another former Somerset man, Anders Mellgren had a few problems even before the tapes went up on the next heat, and was forced to change his machine at the line, after his original steed refused to run after stopping at the line. However once the tapes went up he shot off the line, and into an immediate lead, aided by what looked like a huge roll. Richie Worrall was not far away, but suffered from some rough treatment in the opening turn, soon finding himself at the back. By the time they reached the third turn, Worrall was back in the hunt, and almost produced a pass that would have seen him take both Rockets in one go. He made it past Mellgren, but could not find a route around Steve Boxall, who had taken up the running. Worrall now had the bit between his teeth, and flew after the Rockets man, before charging hard up his inside, to lead off the final turn of the next lap, moving wide to deny Boxall of any chance of a reply. Meanwhile Charles Wright was speeding after Mellgren, and as they came off the final bend of the race, his run just failed to carry him to third place. The Rockets had a little good fortune in Heat 4, as they cut their deficit to just two points. A third level break in four races saw Nikolaj Busk Jakobsen hit the front on the run to the turn, with Alex Edberg and Brady Kurtz not far away. The Rockets pair lead down the back straight, until Kurtz produced an audacious move to carve between both men on the third turn to sail into the lead. From there on he started to pull away, with the result looking inevitable, but lady luck soon intervened. As they ran into the second lap, the young Rebels star got it wrong, and locked up entering the second bend, allowing both visitors through. Kurtz got back on an even keel, and set off in what looked like a vain chase, but by lap three he had caught and passed Edberg, and now had Jakobsen in his sights. On the final lap he produced a superb run to close down the young Dane, but failed by the narrowest of margins to win back the lead at the line. Benji Compton got no further than the first turn, before his machine expired. Things got even better for the Rockets in the next heat, as they took the lead at Oak Tree Arena, for the first time in a very long time. They did it courtesy of a ‘Full House’ from Claus Vissing and Robin Aspegren. Vissing shot off the line to lead up, with Richie Worrall and Aspegren giving chase. As they headed down the back straight, Worrall succumbed to Robin Aspegren’s challenge, and from there on it was all Rockets. The only change to the order coming on the final turn of the race, as Charles Wright moved into third place on the run to the line. The Rebels hit back immediately, restoring their slender lead with a maximum advantage of their own in Heat 6. Josh Grajczonek emerged from a level break to lead before the turn, with Leigh Lanham and Nikolaj Busk Jakobsen in his wheel tracks. Lanham charged down the wide line on the back straight, and by the time they hit the fourth turn he was in the lead, with Grajczonek riding shotgun. Try as he might, Jakobsen couldn’t get back at the Rebels skipper, and in the end the Rebels duo won with plenty in hand. The next three heats were shared, as the Rebels defended their meagre lead. Brady Kurtz showed that he knows more than one way to pass on the Oak Tree Arena circuit, after being led up in Heat 7 by both Anders Mellgren and Steve Boxall. As they hit the second turn, he gave the Rockets pair a preview of what was to come, charging up their inside, just failing to grab the lead. On the next turn, he repeated the move, this time swooping past both of the visiting riders, and moving wide to complete his move to the front. Kurtz pulled well clear after the opening lap to take a bloodless victory, whilst Paul Starke found a Rye House roadblock in his way. Whilst the Rockets provided the winner of Heat 8, they did their prospects no favours at all, as Alex Edberg’s engine destroyed itself as the tapes rose, leaving Aspegren as their sole challenger. Garry May switched his reserves, bringing in Paul Starke for Benji Compton, and it looked to have paid dividends as Starke and Leigh Lanham led up. Aspegren soon passed Starke, and chased after Lanham. Producing a big run around the outside, the Swede sailed past Lanham as the second lap came to a close. Lanham never let him get far away, and threw in a challenge of his own on the third lap, but Aspegren held form, and went on to take the win. Alex Edberg was back out in the next, in a switch with Daniel Greenwood. 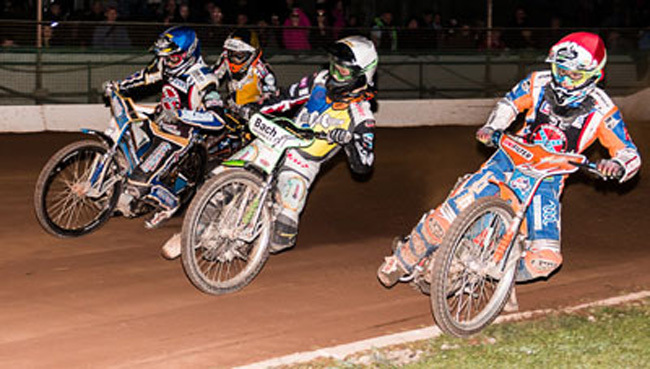 At the tape rise Charles Wright led up with Richie Worrall and Nikolaj Busk Jakobsen in tow. Worrall took second place before the turn, and moved to the front down the back straight. Jakobsen had Wright in his sights, and flew around the wide line to grab second off the final turn of the lap, setting off in pursuit of Worrall. As they entered the final lap, he made thrust up Worrall’s inside, but was beaten off. Not discouraged, he switched outside, and produced a stunning run to blast around Worrall off the final turn, stealing away the win. With still only two points separating the teams, Garry May rallied his men for the final assault, and they answered his call in emphatic fashion. The top end of the Rebels team produced a powerhouse finish to bring about the first part May’s plans for the final stages of the group matches of the competition. The final six heats of the match proved crucial, and the Rebels opened them in the best possible fashion, as the blasted in a match defining 5-1. Steve Boxall was first to show, but had no answer to Josh Grajczonek’s power packed charge around his outside. Leigh Lanham got squeezed out and found himself at the rear, but his experienced head told him not to panic, and neatly picked off Anders Mellgren as they closed out the lap. He steadily closed down Boxall over the next couple of laps, and entering the third he came with a forceful run up the Kentish man’s inside, muscling his way into second as they hit the back straight. Once in second place he soon put paid to any Rockets thought’s of restricting the Rebels score line. Boxall appeared to take exception to Lanham’s move on the warm down lap, but in truth it was an authoritative, hard, but totally fair move. The following heat was shared, with the Rebels supplying the winner. Claus Vissing flew out of the traps to lead up, with Robin Aspegren and Brady Kurtz following on. Kurtz hit the overdrive switch as they entered the turn, and blazed around the Rockets twosome, despite Vissing moving him very wide through the opening curves. Kurtz got to the head of affairs as the moved into the back straight, but not before getting a very close look at the air fence. Now in the vanguard, he powered away to an armchair win, whilst reserve switch, Benji Compton, never got in the hunt. Anders Mellgren just led on the run to the first turn in the following heat, with Paul Starke close up on the outside. Richie Worrall recovered from a tardy getaway, with a run around the kerb, which took him from the rear to head the field as they ran down the back straight. Starke made a good run from bend 2 to the final turn, but could not find a route beyond Mellgren. Mellgren made a brief inroad to Worrall’s lead, but never really got back on terms, as the Rebels man took a comfortable win, with Starke taking third. Heat 13 virtually sealed the Rebels victory on the night, now it was just a case of ensuring the Rockets went home empty handed. Josh Grajczonek led up in the company of Claus Vissing, with Brady Kurtz slowly away. As Grajczonek hit the turn the afterburners kicked in, and he flew around the fence line to head the field. Meanwhile Brady Kurtz made third place with an inside run through the openers, which took him past Nikolaj Busk Jakobsen. He then set out to haul in Vissing, making a similar move into the final turn of the lap to join Grajczonek at the front. Once there the Rebels went on to take an unanswered maximum, with Vissing taking third despite a late puncture, as Jakobsen slowed on the final lap, and limped across the line. The fourteenth heat possibly provided the race of the night, with any one of the four riders in with a chance of taking victory at certain points of the race. Steve Boxall and Paul Starke bounced out of the gates to lead up, with Alex Edberg just getting the better of Charles Wright. Boxall led out of the turn, with Starke right on him. Wright, riding Richie Worrall’s machine, flew past Edberg, and charged into the third turn, with all four riders in a heap. He was on terms with Boxall heading out on to the next lap, hitting the front with a wide run off the second bend. Starke had dropped to the back, but with nothing between all four riders he soon moved back into third place, harrying Boxall as he went. The quartet were all over each other for the whole race, but it was Wright who made the flag his own, with Boxall and Starke next, giving the Rebels a 4-2 victory in a totally enthralling race. To finish the night, the Rebels sent out Brady Kurtz and Richie Worrall in the nominated heat, with Nikolaj Busk Jakobsen and Claus Vissing in opposition. Brady Kurtz blew out of the start with Jakobsen and Worrall next up. As Kurtz led from the turn, he pulled away. Meanwhile Vissing got the better of Worrall, who had taken a big hit in the opening turn, as they entered the penultimate turn of the lap to grab third place. Vissing then closed down over the following laps, and took second place from his team mate late in the affair. The final shared heat brought the scores to 52-38 in favour of the Rebels, but that bare score did not reflect the meeting the spectators had just witnessed, and it would be totally unfair to claim that the Rebels had handed a hammering to the Rockets, because that was far from the truth. There was some stunning racing, from both teams, both at times producing competition out of the top drawer. Heat 14 alone produced more passes than some tracks see in weeks, add to that the majority of the remaining 14 heats, and you have a spectacle that if produced everywhere and on a regular basis, would have crowds flooding through the gates all over the country. Claus Vissing used his knowledge of the circuit to head the visitors score chart, and was ably backed up by the impressive Nikolaj Busk Jakobsen, a rider who looks like he could make a track like the Oak Tree Arena his own. Whilst Brady Kurtz topped the Rebels roster, with a superb 13+1, there were others who were equally as good, if not producing similar scores. Josh Grajczonek produced real captains innings, quietly hitting a paid maximum from his four rides. Leigh Lanham has settled in really well, and been superb since his move to the Highbridge circuit, and his performance on the night, not only gave him a 9+2 haul, but won him the deserved accolade of the 'Case's' Somerset Rebels ‘Rider of the Night’, presented by Sam Abbott of Rebels team partners TQ excel. The evening also treated the fans their first look at the young Exeter Falcons team, being hosted at the Oak Tree Arena this season. They took on a Somerset Rebels junior side, and after some exciting racing the match ended in what Rob Doran, one of the Principals behind the reincarnation of the Falcons, described as an ‘Honourable Draw’, at 18-points apiece. A good number of the crowd stayed behind to watch the match, which bodes well for the remaining fixtures being organised at the Oak Tree Arena by Doran and fellow team Principal Alan Spencer. The next action for the Rebels is a home meeting against Ipswich next Friday, in which they will be looking to avenge Thursday’s defeat at Foxhall.